Inspired by the Northern Lights, the Laplandia Flavoured Vodka collection is made using the same basic ingredients as the original one, only with an addition of natural flavours. 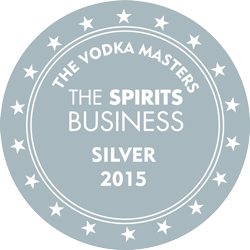 Just like Laplandia Vodka’s, the quality of these flavoured vodkas has been proven by tasting awards and – more importantly – by our very own customers’ feedback. Unlike many of our competitors, we only use natural aromas (as opposed to artificial) in order to preserve the vodka’s original authentic qualities and attributes. Below you will see that the collection consists of authentic Lappish and Nordic wild berries that complement the identity of the brand perfectly. In addition, you will find a variety of more exotic choices that speak to a wider audience. Yet another nutritionally rich wild Nordic berry, the Lingonberry, is one of the popular ones amongst the northern people. A bit like its cousin, the Cranberry, it has a slightly sweet initial taste, followed by a mild bitter kick. Combined with Laplandia’s most essential quality from one of the Northernmost Distilleries in the World, the award winning ground water, this flavored vodka produces a clean taste preserving the berry’s authentic attributes. Best served straight and chilled. Laplandia Coco Shot is a result of a long and devout development process, in which we perfectly managed to combine the subtle and mild coconut flavour with our vodka’s pure essence. The end experience consist of the coconut’s well-known refreshing tropical qualities together with a hint of citrus. Laplandia Lemon Shot is a super premium vodka enriched with a delicate and sweet touch of lemon making it go down smoothly whilst being refreshing at the same time. Finns sure love vodka and coffee. In fact, Finnish people are the biggest consumer of coffee in the world: 9,6kg per capita! Laplandia Espresso Shot is a super premium coffee flavoured vodka tailored to represent the perfect combination of Finnish vodka production capabilities and coffee making skills. Laplandia Mint Shot is a super premium vodka infused with a cooling peppermint flavour, bringing you the experience of an authentic winter breeze. The peppermint gives it a mild natural sweetness that helps it go down smoothly, leaving behind a wisp of freshness on your breath. Today, Açaí berries are considered the world’s healthiest and nutritionally richest berries. 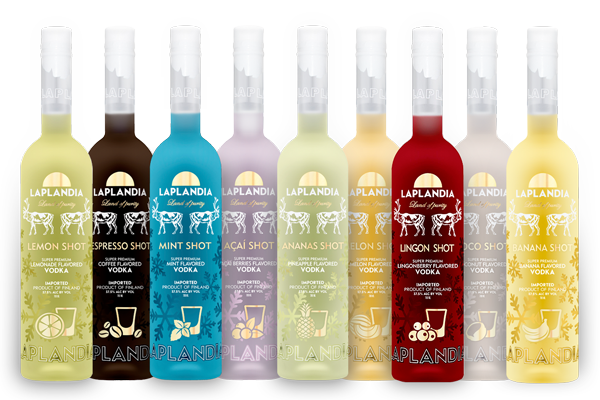 This product combines the best attributes of açaí berries with the well-known essence of Laplandia Vodka. Laplandia Ananas Shot is a subtle and slightly sweet superpremium vodka infused with a natural pineapple flavour that brings you an authentic tropical experience combined with Laplandia’s Arctic essence. Just like the fruit itself, this melon-flavoured vodka is very subtle and gentle on the tongue. While Laplandia Vodka in itself is already smooth and easy, the melon flavour gives it a delicious hint of sweetness, making it even smoother than before. After a long and exciting development process we managed to bring together the banana’s special taste qualities with Laplandia’s arctic purity in a way that will swipe any banana lover off their feet. Laplandia Banana Shot is perfect as a base of a tropical fruit smoothie for instance, and holds endless possibilities in the world of cocktails.